we will in principle support well-designed and affordable STP proposals that seek to split ‘hot’ emergency and urgent care from ‘cold’ planned surgery clinical facilities so as to allow efficient use of beds for planned surgery, avoiding the risk of cancelled operations from emergency admissions. The concept of separating ‘hot’ and ‘cold’ facilities has been knocking around the NHS for decades. And there are plenty of examples where cold work has been separated, such as Treatment Centres, ring fenced elective beds, and long-term use of the independent sector. The argument in favour is that separate cold facilities can run at very high bed occupancy and theatre utilisation, because work is scheduled in advance and not subject to the random intrusions of emergency demand. So you get higher productivity, fewer cancellations, and a more reliable service to patients. The arguments against are about flexibility. Some emergency demand is seasonal, so it makes sense to plan routine (non-urgent) work around the peaks and troughs – that is the logic behind the NHS National Emergency Pressures Panel’s recommendations on “Extending the deferral of all non-urgent inpatient elective care to free up capacity for our sickest patients to January 31”. There is also the practical objection that if A&E is overflowing then you end up using whatever facilities are available, including supposedly ring-fenced elective beds, and even discharge facilities and the day surgery unit. If cold facilities were irreversibly separated, then there would be no safety valve and the hot facilities would explode under pressure. So the decision whether to separate hot and cold facilities must depend on local circumstances. But how to decide? Let’s take a real-life example: an acute hospital that has been struggling with severe bed pressures and long waiting times in A&E. The available historical data shows a seasonal pattern with higher emergency demand from November to February. Should this hospital plan its routine work flexibly around the winter peak, or would it be better to split into hot and cold facilities? Working with the hospital, we started by trying to plan flexibly: re-profiling routine activity around the winter peak to achieve constant bed capacity, while sustaining elective waiting times targets throughout (using the Gooroo Planner model which automates those options). However the model found it could not achieve constant capacity all year round. It still needed extra beds when emergency and urgent demand peaked, even if routine inpatient activity stopped completely. The other problem was waiting times. If you hardly treat any routine inpatients for several months, then inpatient waiting times are going to shoot up. Even if you started winter with no waiting list at all, waiting times would rise so much that targets would be breached by the spring. So we tried another approach. What if we laid on extra bed capacity in winter? Could we flex routine activity around the peaks then? This time the model was able to achieve (nearly) constant bed capacity. 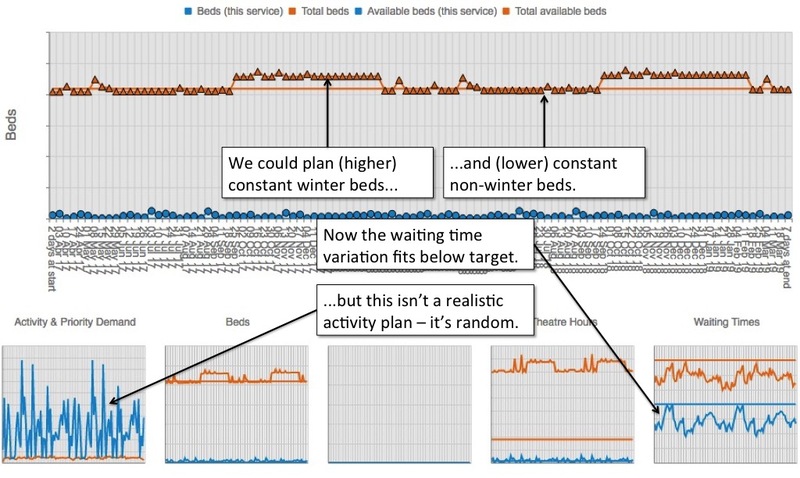 The extra winter beds meant that elective activity could keep up with demand over winter, so waiting times were less variable and could be kept within target. But then we ran into the next problem. If you look at the figure below, the thumbnail chart in the bottom left corner shows (in blue) the week-by-week activity plan for a particular elective inpatient service. 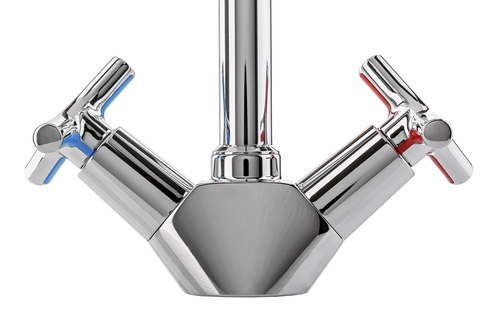 It fits around the peaks and troughs in emergency and urgent demand. But you couldn’t use that plan to schedule patients in real life – it’s far too random and unpredictable. Stepping back from the detail, we can see why. About 90 per cent of this hospital’s general and acute beds are used for emergency patients. Of the remaining 10 per cent, about half are needed for cancer and other urgent patients. So only about 5 per cent of beds are available for routine inpatients. It only takes a small fluctuation in emergency and urgent bed requirements – the 95 per cent – to completely wipe out the routine beds – the 5 per cent. Those fluctuations happen all the time, so when the model tries to plan routine activity around them, you end up with that random, unpredictable profile. Would you rely on that profile, to give the right numbers of routine patients reasonable advance notice of their operations every week? I wouldn’t. By the same logic, it would make matters worse if cold work were only partially split out. For instance, this hospital’s orthopaedic beds are usually ring-fenced for infection control; after separating them out, less than two per cent of the remaining beds are routine, and they would be consumed unpredictably by even smaller fluctuations in emergency demand. So, for this hospital, the recommendation seems clear. 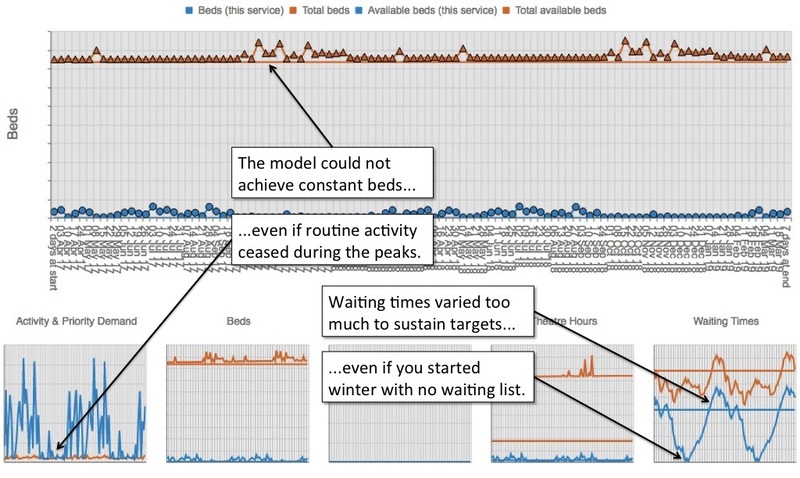 Fluctuating emergency demand dominates the beds, so it is not realistic to plan routine activity around the emergency peaks and troughs. It would be better to split into hot and cold facilities, with flexible escalation capacity on the hot side to cope with the biggest peaks.